Lenovo is one of those interesting hardware makers in that they’ve quietly made plenty of Android devices over the year. I say quietly because it’s very rare that you see one of their tablets in the real world, especially in the United States. This goes doubly for smartphones. As to why we don’t see many Lenovo products running around is hard to figure out; price is always a contributing factor. With the $200 (and lower) space largely held by Amazon Kindle Fire and the Nexus 7, other players fight it out over the $200+ range. Unfortunately, that’s an area that sees a bunch of companies sharing smaller pieces of pie. 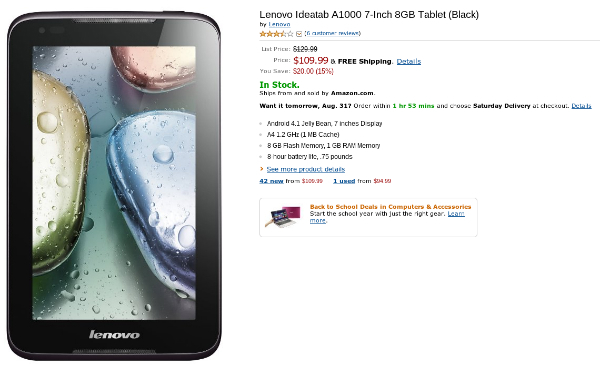 The Lenovo IdeaTab A1000 comes with an attractive sticker price, going as low as $109 in our searches. At almost half of the cost of your standard 7-inch player we would hope for at least half of the performance and functionality, right? Speaking generally about the IdeaTab A1000, we found it to be very vanilla and uninspiring. 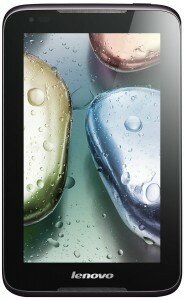 Not that we expected any fantastic hardware touches or high-end finish, but the tablet is just a 7-inch slab of generic. A tad heavier than we’d expect (almost 12oz), it’s the first thing we noticed. It’s not gonna hurt your wrist or anything silly; it’s only noticeable if you’ve spent time with a bunch of other similar devices. There’s quite a bit of bezel surrounding the 7-inch display, making the screen feel a little bit smaller than it actually is. Resolution of 1024×600 is okay, but you’ll not get amazing HD video playback or high-caliber graphics in your games. Nevertheless, we acquiesced when we remembered the price of the tablet. It’s really hard to get upset when you’re spending a shade over $100 on a no-contract device. On the other hand, we weren’t in love with the color reproduction and outdoor viewing was simply out of the question. Powered by Android 4.2 Jelly Bean, the IdeaTab A1000 is capable of running pretty much any app or game you might encounter. There’s hardly any extra software or pre-installed bloatware and we’re only too pleased to have a budget tablet with Google Now. 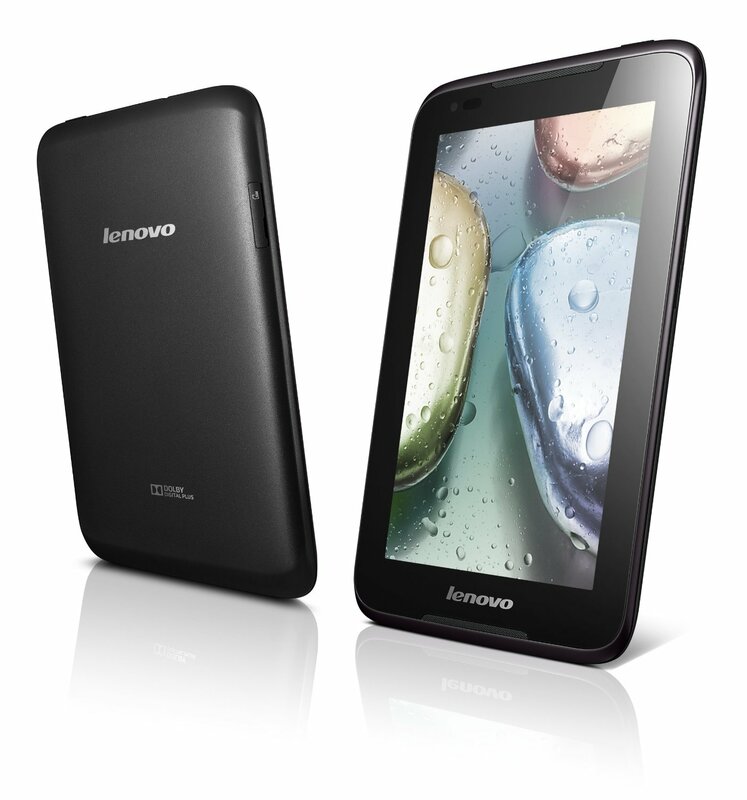 Hardware details include a dual-core 1.2GHz ARM based Cortex-A9 processor/PowerVR SGX531 GPU with 1GB RAM. A good generation or two behind the times this is not the tablet you want for games or media entertainment. In our mind this tablet works better for older users who want to go ultra-portable and keep a tablet in the living room instead of a laptop. Conversely, it’s also a decent enough device to give your children as a first tablet. If you have kids who don’t like to share, you might opt for two of these instead of one Nexus 7. Then again, there’s something to be said about long-term viability and having to replace devices. Storage options include 8GB and 16GB and microSD expansion is always welcome on an Android device. Again, there are plenty of tablets out there with more internal storage, but it comes with a price. 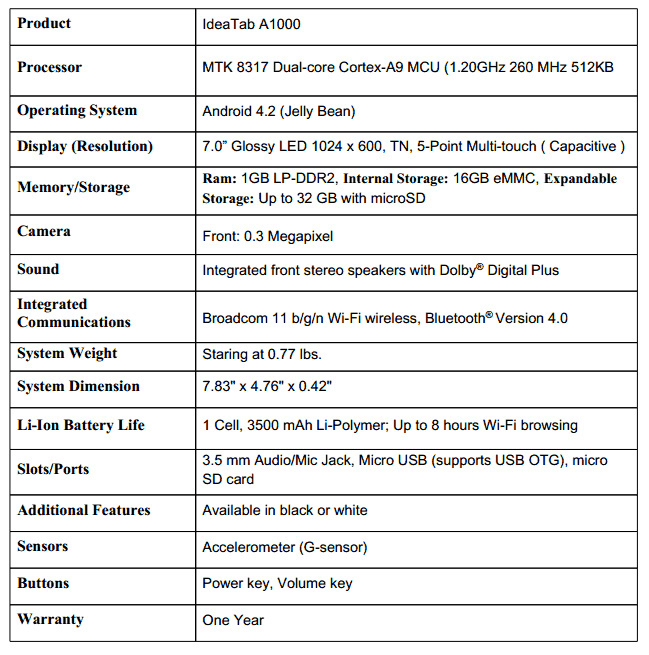 Additional details in the IdeaTab A1000 include aGPS, Bluetooth 4.0, stereo speakers, and a 3500mAh battery. Par for the course, mind you, but we liked that the tablet would last a good two days or more with average use. Suffice it to say, this would be just fine for car rides or an extended reading session on the patio. Sound is average and gets loud but we were never blown away with lows. Heck, even highs were sometimes shrill or crackly. There is a camera on the tablet, however, it’s merely a VGA shooter. Although there are a handful of shooting modes present we cannot imagine pulling the tablet out for a selfie or for video chat. It’s there, it works, and that’s it. Hard to argue with that price point; shortcomings are easily forgiven. Do not mistake this tablet as being something you might weigh against the Nexus 7. Speaking in strictly hardware terms there’s less than half of the performance present. If it were up to me, I would recommend this device only for the demographics I mentioned earlier. However, if you’re an existing Android user looking to complement their smartphone, you will come away unimpressed. Need to scoop one of for a youngster or someone who has no experience with these new-fangled tech products, it’s hard to argue with the price. Chances are good that you’ve seen Android tablets with $100 or less price tags floating around the department store or drug store. Can you recall the brand name? I bet you can’t. Lenovo, while not quite as big a name of Samsung, it does give us a sense of comfort. It’s nice knowing that the company will likely be around in a few months and will support the warranty (one year, by the way). The IdeaTab A1000 really only shows flaws and shortcuts whenever you compare it to another device in the same space. Handing it off to different friends and family members, the general reaction was usually like, “hey, this is pretty cool…how much does it cost?” Showing it to some of my more tech-savvy friends who had experience with smartphones and tablets, the reaction was more along the lines of, “what the heck is this thing? It’s kinda chubby and boring”. 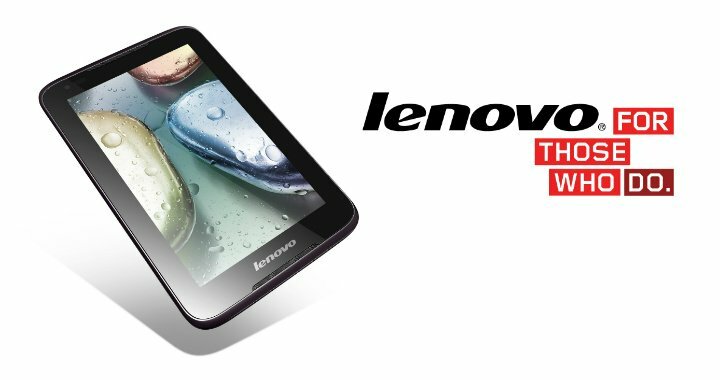 Regardless of your needs, the Lenovo IdeaTab A1000 is hardly the worst thing you could do with your money. It all comes down to determining who you’re shopping for and what you expect of your device.